CLA or Conjugated Linoleic Acid is a fatty acid and, surprisingly, it is the indicated supplement for anyone who wants to lose fat and increase the amount of lean muscle mass. Several studies prove that the consumption of this supplement by people who have a deficiency of this acid potentiates the reduction of body fat. It’s responsible for converting fat into energy. Its consumption increases the metabolic rate causing more calories to be burned at rest. 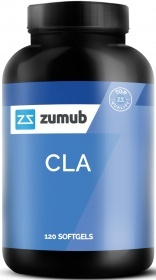 It's difficult to get effective levels of CLA through food, so you can meet your body's needs through Zumub's CLA supplement, which combines the highest quality with the lowest price. The Zumub CLA formula will help you to get closer to your goal: a healthy and defined body. Increase and maintain lean muscle mass. Prolong the feeling of satiety. It will be a great addition to the weight loss process. And you can choose to take it without adding a diet or exercise! If you are looking to fight excess fats and to increase muscle mass naturally and effectively, Zumub CLA is the right choice for you! Best price per serving, no after bad taste and upset stomach. Will definitely buy this again. 5 star for me. WARNINGS CLA : Do not exceed recommended dosage. Keep out of reach of children. The product should not be used in case of hypersensitivity or allergy to any of the ingredients of the formulation. Food supplements should not be used as a substitute for a varied and balanced diet and healthy lifestyle. Store in a cool, dry place. BEST BEFORE: Please see lot number and expiration date stamped on the packaging.